A book that is a pleasant mix of Hindu Mythology, suspense, adventure and mystery. Renowned marine archeologist Dr. Balaan and his associate Yogi find themselves on an unusual mission when billionaire collector Stalin Malhotra hires them to find the most legendary gem in Hindu mythology – Semmanthaka. As excavations off the Saurashtrian coast begin to reveal that Krishna’s Dwaaraka existed, Stalin believes that the Semmanthaka must exist too and what’s more, he has a clue in hand. Thus begins the second quest for Semmanthaka – a gem so brilliant that it can make you richer than Kubera; a gem so cursed that it brings death and disaster to all who covet it. Soon, Dr Baalan and Yogi find themselves thrown headlong into an action packed, life-changing adventure that ranges beyond treasure hunting, beyond this realm, beyond their own current incarnations, in a race against time to save our very planet and uncover some of the greatest secrets of Bhaarath-varsh and a great spiritual truth. One can only find the Semmanthaka when one does not want to. The clock is ticking. As the forces of Adharma gather, can Dr Balaan and Yogi stand the test of faith or will they too succumb to the lure of Semmanthaka? The author is a Professor of Pharmaceutical Chemistry at a College in the South. He has published many scientific articles in his field as well as very well received articles in the field of Higher Education. One of his recent articles on Higher Education appeared in the prestigious NATURE ASIA. He has also authored popular articles, blogs, and short stories on a variety of topics. Prior to this work, he has also published four books of fiction. The author is also an avid musician and performs professionally and has a passion for chanting complex Vedic Hymns. He also dabbles in online flight simulation and passionately trains in the Mansuria Kungfu form of martial arts. Posting two reviews from Amazon.in by consent of the readers.. I should begin by saying I do not read much, but this book got me glued to it. From the start to the end. Some say that the best review for a book is to summarize the book in one word. The one word for this book is “Touching”. Science, Spirituality, Mythology, Treasure hunt, History & Wildlife – do all these or any of these intrigue you? Then, this book is a must read. In this work of fiction, the author uses all these elements (and more) to build an enchanting story line. The story is full of unexpected twists and turns, all along the plot. The skill of the author to use the events from mythology and history is commendable. 1. Historical and mythological context. 2. Excellent creativity all along. 4. Spiritual dimension to the very plot. While reading a few sections, one cannot help but appreciate the attention to details & vivid narration of events. From physics to puranas, from eternity to energy, from greed to God; this book has all of it and more. The references to real world examples, anecdotes add a substantial weightage and an aspect of reality. It also kindles the interest in the reader to explore the subjects in more detail. In all, this book is for everyone. Read and enjoy. A beautiful portrayal of the author’s imagination for the second quest of the brilliant gem . Dr. Syd.K has very aptly used his creativity to build up the suspense about this search without digressing from some of the facts regarding the Syamanthaka itself. A must read for everyone of all age groups. Whilst the book is very successful in keeping the reader’s interest alive, it also gives us some insight regarding the virtues of this great gem . The author’s attempt to stress the importance of chanting the name of Lord Krishna at all times adds spiritual value to the book. I selected Semmanthaka by Dr. Syd K to be in my wishlist just by looking at the cover and title. They aroused my curiosity. Much has been said in our ancient texts about Semmanthaka and some wonderful stories were built around it. And trust me after reading Semmanthika, I realised that the story has exceeded my expectations that I had built by looking at the cover. This book is a mythical and historical roller-coaster of a story. Renowned marine archeologist Dr. Baalan and his associate Yogi find themselves on an unusual mission when billionaire collector Stalin Malhotra hires them to find the most legendary gem in Hindu mythology – Semmanthaka. As excavations off the Saurashtrian coast begin to reveal that Krishna’s Dwaaraka existed, Stalin believes that the Semmanthaka must exist too and what’s more, he has a clue in hand. The story starts with a search for Semmanthaka. Billionaire Stalin Malhotra, a shrewd treasure collector hires a freelance marine archaeologist Dr. Shiva Baalan and his assistant Yogi to find Semmanthaka. Dr. Baalan, is a strong believer in science, and is skeptical about mythology. Stalin on the other hand has absolute belief that Semmanthika exists and has clues to locate it. He provides them an ancient manuscript to start their hunt. The manuscript is 5000 years old. Dr. Baalan and Yogi start looking for clues that they hope will lead them to the gem. They visit the Rann of Kutch to find the next clue. One thing leads to another and they soon find themselves knee-deep in a quest to save the earth. They expect the journey to be archaeological, but it ends up being spiritual too. The author has wonderfully woven incidents from mythology and history. I don’t want to reveal any characters as it may spoil the reading experience. The narration of fight between animals. At three different points in the story, the author has wonderfully described these fights. While reading those parts, I was able to visualize it and felt that it was being aired on television. It gave me the feeling of watching animal planet. The story is to the point. And that I liked. Not on a single page, do you feel that the author has flooded the manuscript with unnecessary words. Each line contributes to the story. The combination of multiple genres. You will find mythology, history, magic and fantasy. The author has used a completely different style of story telling and made it flow through time. Character importance and revelation. Author has nicely used characters from the past and arranged them properly to show a well threaded story. The suspense created around those characters along with their revelation makes the story more interesting. For those who don’t know about Semmanthaka. It is considered one of the mythical gems which has mystical properties. Some texts says it can create gold while others support its radioactive nature which converts other metal to gold. But the truth is the book has refocused our attention on the gem. Reading the book, gave me an experience similar to watching a big Tamil or Telugu film based on an ancient treasure hunt. Fans of Ashwin Sanghi YOU will surely like the book. Semmanthaka brings out a different perspective of Lord Krishna. A brilliantly conceived plot drawing on Indian mythology (puranas) and touching the lives of three men, spanning the millennia, a tryst with profound heroes of Indian history ancient and modern, interlaced with mystic science fiction with moments of devotional intensity and divine revelations culminating in an Indiana Jones kind of climax; all these elements are cogently connected to make the book an unputdownable read!! Superb work!! The author takes us on a thrilling adventure in this book. There is not​ even a single page which I felt like skipping. This book is a must read for all mythological fiction-fans. There​ are certain events which transport the reader to a different world. Outstanding climax. Expecting more books in the similar genre from the author and the publisher. I would definitely recommend this fascinating adventure to all book lovers and Indian history & mythology fans. There are many overrated authors and books in this genre today but this book stands out for its clean entertaining plot which makes it a good read. Indian mythology is enriched by various moral giving tales of gods, goddess, and gems. There was a gem called as Semmanthaka, which is known as to directly derive from the Sun god. This gem has the ability to produce eight bharas of gold every day. I didn’t know about this gem until I read about it on the internet. The story of this gem is literally interesting and this increased my curiosity to read this book. I must thanks to the author for providing a copy of this book in exchange for an honest book review. Stalin Malhotra, a billionaire, and treasure collector have already collected various ancient treasures. This time he has decided to find Semmanthaka gem which ancient scripture says produce gold every day. Stalin hires renowned marine archaeologist Dr. Shiva Baalan and his assistant Yogi Yaadav. Stalin gives an old scroll to Dr. Baalan which depicts about the Semmanthaka jewel. The scroll is discovered in the small temple of Rann of Kutch. Being a scientist, Dr. Baalan found it hard to believe on any old scroll to start this search but they don’t have any other clue so they decide to go with this. The Rann of Kutch brings various amazing twist and turns in this search and they found themselves in the second quest. (You need to read this book to know the first quest) The book then follows various important events of our history which help to shape the future of India. What was exactly the second quest? Will they ever find the Semmanthaka gem? How this journey ends? What were the events which helped to shape the future of our country? Do read this book to know the answers. The author has avoided hard language and over description keeping this book easy for all type of readers. The narration is truly engaging, which will help you to finish this book in two sittings. Before picking up this book, I was truly unaware about the Semmanthaka gem and its mystery. The author has brilliantly created a quest followed by our mythological and historical stories. There are handful characters in this book, but the author has did full justice to it. This book doesn’t have any obscenity which makes it suitable for all the age groups. There were certain times in the book when I literally forget that I am reading a book and I am not there, you can imagine how beautifully the author has narrated this book. There were various fight scenes between animals, which are beautifully written by the author. I need to admire the imagination of the author. Each and every page is entertaining. You need to read this book, I am sure you will find yourself floating with this amazing quest. Fantastic blend of Adventure, Science, Action, History, Spirituality and other elements (suspense, pace etc) which do not allow the regular readers to keep the book down after reading some amount of pages on a daily basis. A nice book that has to be available at everyone’s book shelf. It is a appealing and applicable for all age groups. Glad to see an author who has done a great job without including a female character and related stuff. This is a rare thing that I appreciate in this book. Looking forward for author’s next book. All the best and readers will definitely enjoy and say WOW!! Semmanthaka is very interesting twists and turns; the author has balanced conveying;the spiritual aspect of Lord Krishna and Krishna conscious with an interesting story;well-crafted story that keeps the readers on toes. 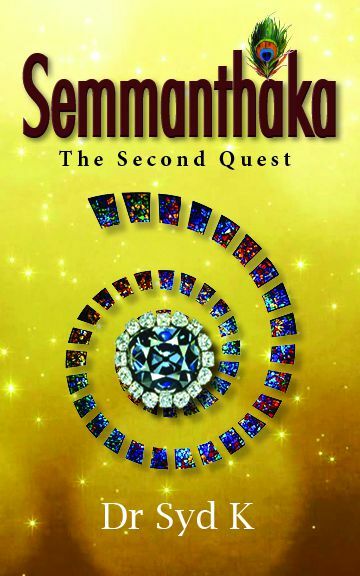 Semmanthaka: The Second Quest by Dr. Syd K is a mythological fiction that enthrall the readers in the quest of the fabled magical gem, Semmanthaka. Although there have been mentions of the Semmanthaka in our ancient texts, this book has brought its story out for us to dwell on it once again. After a series of recreations of the Mahabharata and Ramayana and other epics, this book directs us to a new treasure that, in my opinion, has not been in the limelight much. Dr. Balaan, a freelance marine archaeologist, along with his assistant, Yogi, are summoned by Stalin Malhotra, a wealthy treasure seeker, to find the Semmanthaka gem. With an ancient text for a clue, the duo begins their journey towards finding this age old treasure but soon hit a dead end. What happens next transpires to be a magical, unbelievable journey that both Dr. Balaan and Yogi undertake. Soon, they realize that this quest of the Semmanthaka is much more than just simply finding it. There is history involved, and also the present state of the world which all hangs in a delicate balance which can only be saved if the Semmanthaka is found. An exciting journey that involves climbing the Himalayas to foraging in the Rann of Kutch to boat rides in the sea, the clock is ticking away as the duo looks for the Semmanthaka. Semmanthaka: The Second Quest is a quick and absorbing read. For someone who enjoys mythological fiction, I simply couldn’t put the book down. The transitions from history to the present day were neatly done, the credit goes to the narrative. The story is an adventurous tale in which the reader gets easily engrossed. The writing style is spot on with just enough details and descriptions with respect to characters and situations. The story line is well plotted and the events that take place are truly enchanting. A string of surprises and twists in it enhances the reader’s experience further to make it a thoroughly enjoyable read. The way the story ends is unexpected, in a good way. All in all, a well balanced story, with the passion for Krishna and Bhaaratvarsha quite relevant through the pages. Thank you for your fulsome praise. Praises such as this will help expose more readers to Semmanthaka. This book is gaining traction and we hope many more readers will be exposed to this book so they can enjoy it. When I started reading Dr. Sydney Kishore’s, “Semmanthaka-The Second Quest” I did not know what to expect, frankly. I have read all sorts of treasure hunt related books and movies. National Treasure, starring Nicolas Cage is the best example. Bollywood also had a go at it, with two dastardly samples to its credit- Rudraksh and Naksha. To my utter delight, Dr.Sydney Kishore has proven me wrong and I think that there is hope for this genre – should Dr. Kishore continue writing in the same vein. Dr.Sydney Kishore is a man of science – he is a professor of Pharmaceutical Chemistry in a reputed college in South India. He has published many scientific articles in this field and has also wrote many short stories and articles. He has passion for Vedic Ghanam chanting and is a professional singer of Kishore Kumar songs. Clearly, a man of many hats. What happens when science and Hindu philosophy meet? Let us find out. The Semmanthaka gem [Syamantaka for some people] is a gem mentioned in Vishnu Puraana and Bhaagwata. Legend has it that the gem belonged to the Sun-God, who used to wear it around his neck. It was said that the gem would produce around eight bharas[ancient Indian weight measure] or 170 pounds of gold every-day. Thus, whichever land possessed this gem would never face any droughts or famines. A noble tribesman-Satrajit belonging to Dwaraka[ Satrajit was also a subject of Dwaraka- Lord Krishna’s kingdom] offered penance to the sun-god for a long duration of time.Impressed by his penance and dedication, he gifted the Semmanthaka to Satrajit. Krishna requested Satrajit to handover the jewel to the public coffers so that the gem could be used for the greater good. Satrajit, however, did not comply. He was quite besotted with the jewel and did not want to part ways with it. Satrajit gave the jewel to Prasenjit, his younger brother to wear it – so that he may flaunt it too. In a night of drunken turpitude, Prasen loses his way in a forest, gets attacked by a lion and is killed. The gem is found by Jambav [A great mountain of a bear-man who was blessed by Lord Rama] who takes it and gives the gem to his daughter – Jambavanti. Krishna is implicated in this scandal and is accused of being behind all this. To clear his name, Krishna abdicates his kingdom and goes in search of the gem. He has a big fight with Jambav, lasting 28 days to retrieve the gem. Jambav realizes that Krishna is a reincarnation of Lord Rama and asks him to marry his daughter. Krishna returns the gem to Satrajit, who is still not ready to part ways with it. [To his credit, Satrajit first offers the gem to Krishna to keep out of a feeling of remorse. But Krishna refuses and ask Satrajit to retain it and promise to do charity with it. Satrajit reneges on his promise] Krishna and Balrama have to go to Hastinapur after they learn that their cousins- the Pandavas were burnt in a fire. Meanwhile, three more gents – Akrura, Kritavarma and Shatadhanwa had their eyes on the gem. They attack Satrajit in his absence, kill him and make off with the gem. Krishna and Balarama have to rally again. Krishna kills off Shatadhanwa. Later, Krishna finds that Akrura is in Kashi, who has the gem with him and convinces him to bring the gem back to Dwaraka. OK- great stuff, but then how does the book tie in to this story? The book is about Dr.Baalan, a marine archeologist, his assistant Dr.Yogi Yaadav and Mr.Stalin Malhotra, a billionaire who recruits the two to hunt for the Semmanthaka so that he may add it to his personal collection. Incredulous at first, Dr.Baalan accepts to search based on some clues which Stalin provides them. Based on the recent excavations off Saurashtra [India’s west coast] and proofs that Lord Krishna did exist, the two begin their search in Dwaraka, since the gem was last observed in Dwaraka, as per legend. Their search takes them further to an inland temple, somewhere in the Rann of Kutch and they meet with an elusive, mysterious mystic. The mystic tells them some unbelievable facts and warns them – the earth as we know it, is at the cusp of Adharma and that they are the ones chosen to rid Earth of evil. Will Dr.Baalan and Yogi be able to achieve this mission? Will they be able to locate the Semmanthaka? To have an answer to these questions, you need to read the book. What are the highlights of this book? Obviously, the story and Dr.Kishore’s narration are the main reasons you should read this book. Dr.Baalan and his Yogi’s camaraderie is the second reason. Bu the pièce de résistance is Stalin Malhotra’s character, who uses a rather remarkable catchphrase, “Mother Lode da Puttar!” It is quite zany and definitely helps you paint a mental image of the character. This book is fast-paced, racy and drives home the point quite effectively. Most importantly, it also serves as a tool in reminding oneself that we as Indians need to pay respect to the great sons of Bhaarath-Varsh, who filled the entire land with great pride. It also compels you to sit up and acknowledge our culture and our legends. [I think this is what DrKishore intended all along, secretly]. Concluding, the book is written in simple English, is quite easy to follow and a valuable source of knowledge. The book sways away from swear words or adult content of any kind. This makes it a read for all ages! Go and pick up this book immediately! I received this ebook for review. First of all, can we just appreciate the beautiful cover of the book for a moment? I love mythology, it is one of my most read and most cherished genre. Normally, finding a stand alone novel in this category is very rare. And this beauty here, is my all time favorite now! I am so happy to find this book! I had a little idea about this gem and have heard stories too. But author here just takes the story as a base and adds too much more to it hat the story becomes much more interesting. Story starts in the present day with the archaeologist Dr Baalan and his assistant, Yogi. They are on a mission for the treasure hunter, Stain Malhotra. But soon enough, the plot takes shifts into many different times of era and the story starts to get complex. At times, the storyline seems to shift from the main stream, but trust me, it all comes togather in the end. The archaeo duo find challenges after challenges, which are not only captivating, but also heart pondering. I was on the edge the whole time I read the book. All the characters are so strong and perfectly portrayed. Stalin, though has come for a very short period of time, is able to leave the impression on reader’s mind. And, one can not read the book without admiring Dr Baalan and Yogi. Also, author has done an extraordinary fine work with describing the fights between animals. The entire book feels like a TV series with history, mythology, action, fantasy and wildlife adventure. Trust me when I say that this book is going to leave a hangover on a reader’s mind, for sure. If the author decides to write another book on something along this line, I will be more than happy to read! All in all, a great stand alone of its kind and if you like mythology mixed with treasure hunt, give this a shot! Thank you foir the praise. We hope you will also be able to spread the word with family and friends so many more people can read it. The puranas’ tales always enthrall and engage you with beguiling stories . Irrespective of age, everyone would enjoy the entertaining historical and political drama. The message of dharma , “Good always triumphs over evil” is highlighted in different ways , using various scenarios. Even today they are relevant in propagating the ethical principles and golden virtues we have to follow for a peaceful and happy life. Semmanathaka the Second quest , is a beautifully crafted religious saga written in the parallel lines of the first quest for the immortal gem.The period drama has engaged me to such an extent I have read it at a stretch. Starting from the present days , revolving around the various historical periods set in the old Bharatha Desa it ends with the where it has started. The author has penned a spiritual period drama fulfilling the sprawling historical journey adding a crown to the literary world. Thrill, excitement and the blitheness have evoked by the fantastic read. The book starts with a Foreword form the author wherein he states that he has taken the tale of Semmanthaka from the Hindu Puraanas .The story begins with the meeting of Dr.Shva Baalan, a freelancing marine archeologist , and Yogi his assistant , a geek who has devised a computer programme to decipher ancient scripts, and Stalin Malhotra the head of conglomeration of companies called Zamorez Inc Corp . The crux of the same is to give the assignment of searching for the Semmanthaka gem said to be located at the city of Dwaraka as mentioned in the great Epic Mahabaratha, where Lord Krishna existed. The have a got a cue in the form of a writing from a manuscript hold by Stalin. In search of the gem Both Dr. Balan and Yogi went to a temple situated near the banks of Rann of Kutch. There they meet the priest who takes them to Jaara baaba 100 years old his guru, a wise ascetic. The first part of the book deals with the flash back of Jaara baaba, occurred in his various births . In these stories he tells how he comes across a part of Krishna ‘s flute . It spans to various eras starting from ancient historical era to that of our the Independence struggle . The great personalities Chandragupta ,Shivaji and Netaji have got great roles in shaping the story. The second part belongs to the Semmanthaka gem . There are so many knots unravelled and there are myriad adventures and a lot of action. Bloodshed, casualties, victory and treachery occur in this mythological saga. Whether the trio finds out the Semmanthaka or not , and after, that what befalls them are the questions that arise and readers have to read the book to know the answer. The astute title and the grand cover design are magnificent enough to provoke curiosity . The blurb is strong and it ends with the following question. This instigates us to read the book and know the answer. The chosen concept and the perfect execution astound me. I have felt flabbergasted by the engrossing narrative prose and at times I am hooked to the extent of forgetting myself. In the first half the pace may be somewhat slow, but in the second one it is fast .The aroma of history mythology, coupled with the latest technology is pleasant to go for the heartening read. The ancient places, horrifying events and dramatic scenes come alive in front of our eyes through the lovely descriptions and a host of indelible characters. The novel carries all the ingredients to entertain the reader like, suspense. twists and turns surprise and spine chilling thrill . It has got a fitting unexpected climax. I admire the chapter titled Back at the city of Dwaaraka , wherein Satrajit has got the Semmanthaka gem a gift from Lord Surya and the missing of his brother Prasenjit who has gone with the jewel in an inebriated mood . I also like the various facts given in the book. Mind reading, fore hosting, super human mystic qualities, deciphering animal language , meditation for hours and body control by yoga etc would take you to the realm of mystery and mythology. The fights between Gods and humans, humans and animals and among the animals themselves are portrayed nicely. The author reveals the vagaries and idiosyncrasies of the human mind in their true colour and dimension. I adore the book for its storyline and the lessons it teaches us. Dr Syd, a scholar has done a brilliant job in crafting his favorite tale taken from the puraanas . The story teller in him has made the book a sure page turner. Readers who want to read about our Puraana and Epic may find the book very interesting. Everyone can read the book . You can suggest the book for all and also give as a gift on special occasions. The book is worthful every penny and I suggest you grab it and enjoy the amazing read. A wonderful birth of your excellent talent . An exquisite amalgamation of the animal kingdom, History, Myth and the beautiful culmination of all the interesting events unto His Feet. The reader gets a brilliant picture of comparative aesthetic scholarship in elegant prose—a feast for even a discerning student. The transcendental activities of the Supreme are very well knitted. God bless you my friend and may you come out many more beautiful myths. I LOVED the book! I couldn’t put it down. Dr. Syd K is an amazing writer!!!! My most favorite parts were the incidents involving Kautilya and Shivaji. Those were beautifully written! I was able to visualize each and every scene with mesmerizing details! The descriptions were THAT wonderful! The climax was BRILLIANT! Loved that the author chose a very wonderful and apt place as the location of the Semmanthakam. The description left me in a trance. I was able to feel myself transported to that great place. The experience was mystical!! I was wondering why couldn’t that idea be true! Lord Krishna’s description gave me goosebumps. It was awesome and reading it was a deep spiritual experience! The description of pralayam was out of the world. This book is a great need for the people living in this materialistic world. Dr.Baalan’s act at the end of a the story is such a thoughtful ending to the book. I ADORED the character of Yogi! Semmanthaka is a clear dedication to Lord Krishna and his countless devotees. It is a story about a Gem that has been travelling through time through many “Yugs”. The story begins thousands of years ago during the time Lord Krishna had his first birth. There is a Canadian NRI who is possessive about worldy treasures and enjoys looking for new ones. He hires an archaeologist Dr.Baalan to search for this gem which had been lost ages ago. According to him, the city of Dwarka where Lord Krishna lived, had been buried below the sea during a tsunami and that if searched properly , the gem might still be found. This Gem had the quality of producing gold every day thus making its owner rich beyond comprehension. Dr. Baalan alongwith his assistant Yogi agree to his project and start looking for it. This is when they realize that the gem which they have been hired to search for is no ordinary gem. It has its descent from Lord Krishna and it has travelled 4 yugs. They meet a holy man, who guides them on how to get the gem and this gem will prevent the world from facing a major calamity. This now no longer becomes a commercial quest, but a quest which will save the world. The onus now lies upon Dr. Baalan and Yogi on how they would go about hunting for this treasure. The narration of the 4 yugs is very clear and one can visualize each and every scene the author is trying to communicate. The story begins with how the gem came into existence in the first place, then how did it disappear and how it reappeared in every yug until it is retrieved by Lord Krishna himself in the present day. The gem travels through the period of Mahabharata to Chandragupta Maurya to Chatrapati Shivaji and to Netaji Subhash Chandra Bose! Dr. Syd has cleverly interwoven the important historical episodes with his fictional story and makes us believe that for every important historical event that occured, Lord Krishna had a direct influence on the result. If he wasn’t there, history would have been different and the world would have been different. The author is clearly passionate about wild animals, in the sense the description of each and every animal, their movements, their fights is described in detail and with utmost precision. Overall it is a story that will make you witness history in its best form. Beautifully narrated, edited, and a type of story that will keep you intrigued and glued to the book and wonder what would happen next. Writing a tale that spans across thousands of years and to connect the reader with it is a mammoth task and the author has done it successfully here. Absolutely recommended, and would definitely look forward to the next quest Dr. Syd will be engaged in. Very much enjoyed the excerpts from your novel. Like the way you’ve married fact with fiction – the mark of a good writer! It takes a lot of tenacity to start a novel. Even more to complete it. Indian mythology is always fascinating for writers. It’s a wide variety of content and strong characters have opened up a great opportunity for creating new stories. Semmanthaka is a simple mythological thriller that mixed many events from history and myths. You can find many characters from history as well as mythology here. And the author has well maintained the suspense factor in revealing the events. Dr. Balan and Yogi were two archeologists who have contracted for finding a Semmanthaka gem by a billionaire, Stalin Malhotra. From that moment their life started to change. It was not only a quest for finding Semmanthaka gem, but also themselves. Well, to be honest, I have mixed feelings for the novel. Initial Chapters were thrilling and somewhere in the middle it loses its pace. Initially the character Stalin Malhotra felt like a strong, capable villain, even the name which is named after the dictator Joseph Stalin but towards the end he easily accepted his defeat. Characterisation could have been better. The stories remind me of Vikramadithya and Betaal stories in which each chapter contains a different story. About a 50 – 60% of the book where it explains the story of Krishna’s flute, it happens in different timelines. The author has been mixed history and myth of the story quite brilliantly at this point. Whom do I suggest this book to? To the devotees of Krishna and to those who have an interest in Indian mythology.